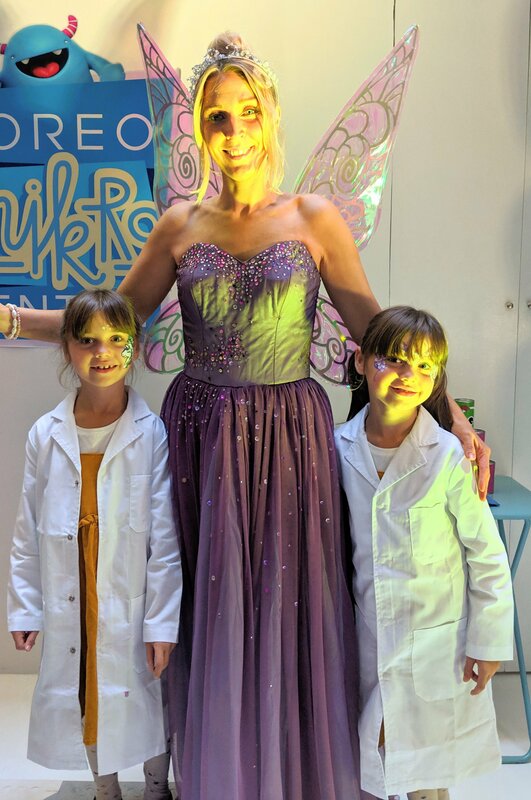 The twins and I recently travelled up to London for a press event at ICETANK with Foreo Mikro Dentist. 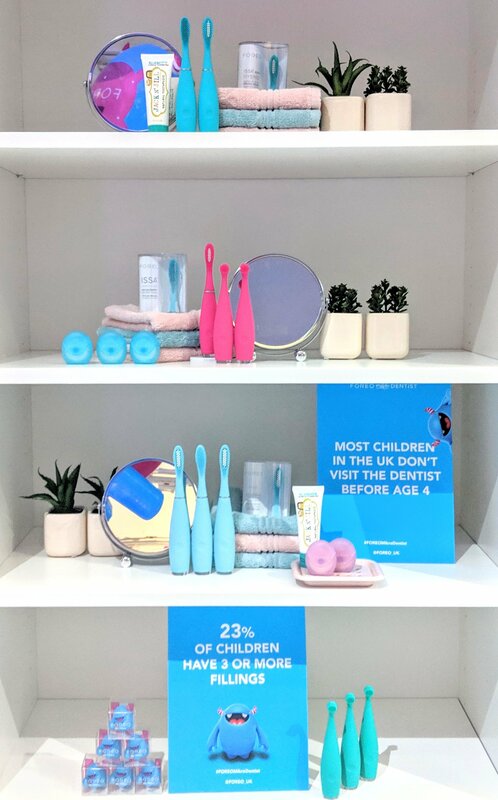 Foreo are a Swedish oral care and dental care brand which originated in 2013 with just two employees and now has over 2000 employees. 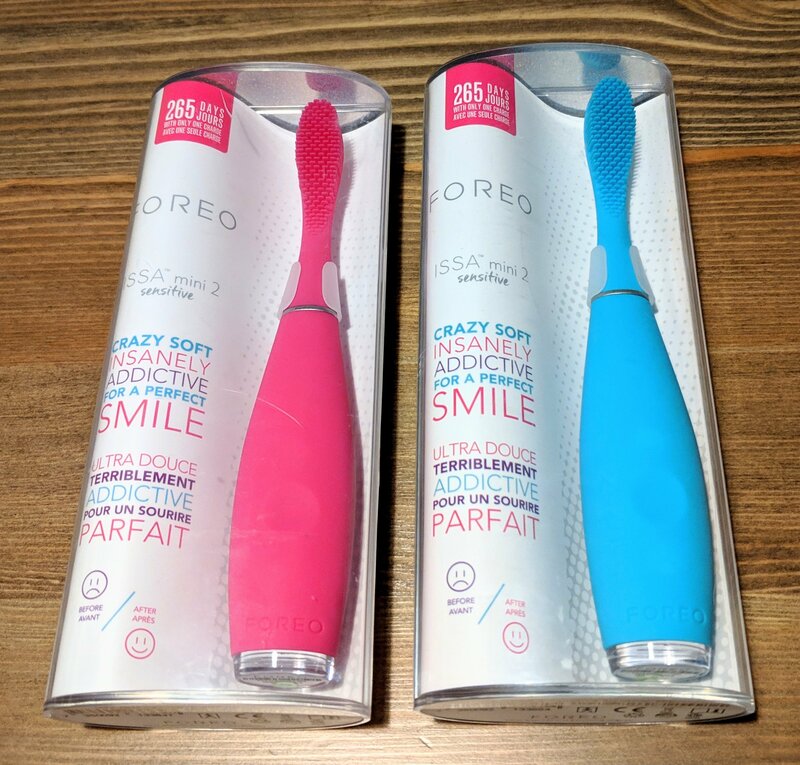 Foreo create a number of products, such as the Foreo Issa electric toothbrush, Foreo Issa Mini kids electric toothbrush and Foreo Issa Mikro infant electric toothbrush. 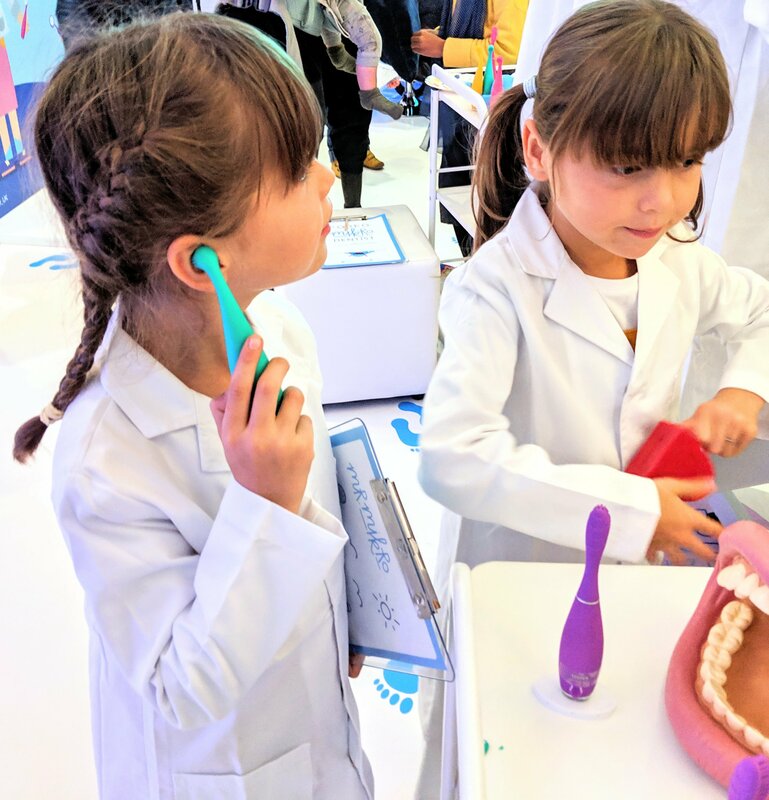 I was interested in taking my 6 year old twins to this event to learn more about family dental care and the Foreo Issa toothbrush range. Toothbrushing, in my home, is somewhat of a mixed matter. 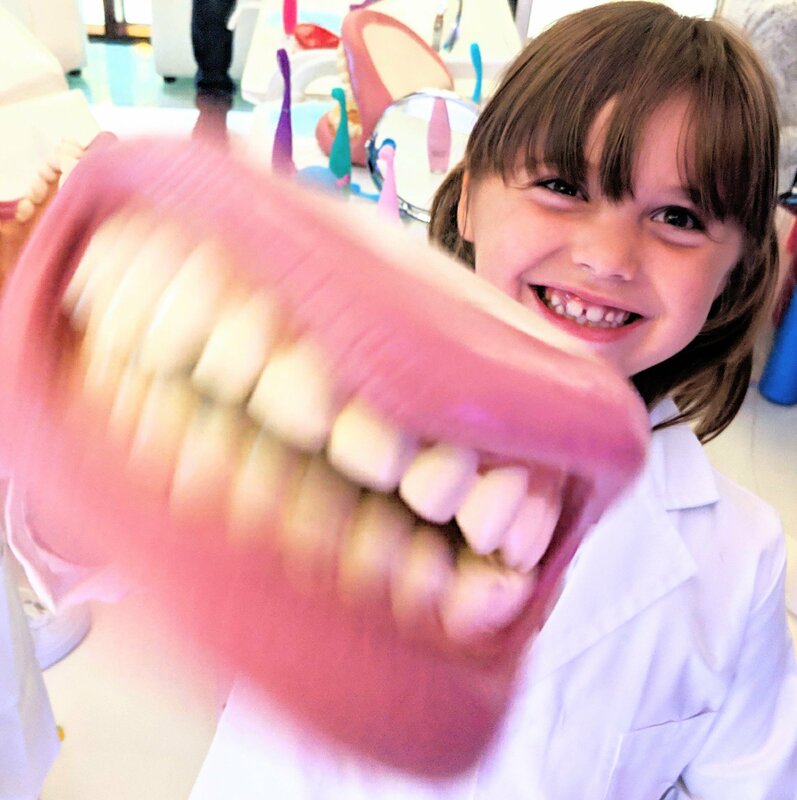 If you read my recent post about my dentist phobia and my horrific tooth extraction ordeal, you’ll know my fear of dentists is no laughing matter. I DO brush my teeth twice a day and floss once a day, but I must admit, this wasn’t the case when I was a young adult in my late teens and early twenties. Add to this, the damage to my teeth from various cancer treatments and my reluctance to see a dentist and you can probably picture how bad my teeth are. I don’t want this for my children. I don’t want them to inherit my fear of the dentist. I don’t want them to get into bad habits with dental care either. 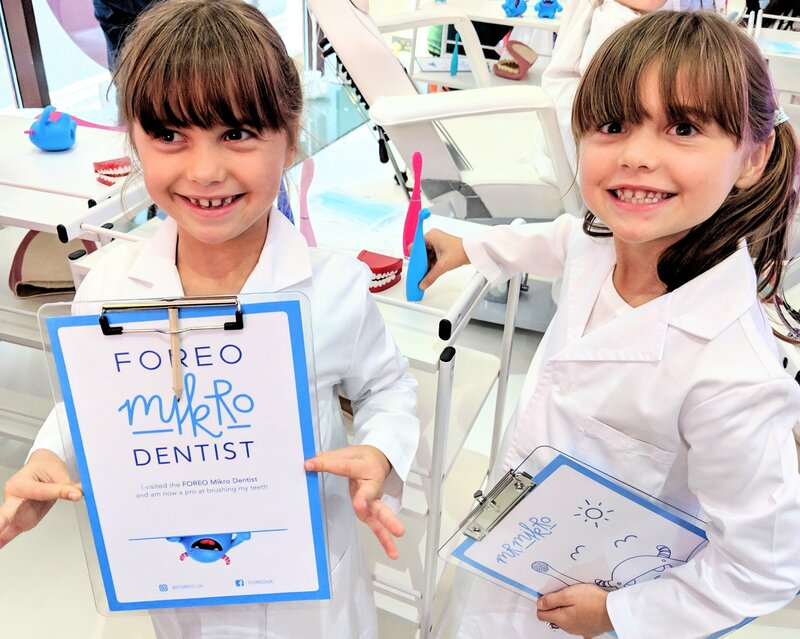 So, taking two of them to an event with Foreo Mikro Dentist seemed like a great way to get them excited about taking care of their teeth. In general, the twins don’t mind brushing their teeth, but it’s not exactly something that excites them. I tend to brush their teeth for them for one minute first, and then let them brush them for the second minute. I do this because I’m not convinced they’d do a very thorough job if left entirely to their own devices. Two year old Bear, absolutely loves brushing his teeth. He demands to brush them every time he goes anywhere near the bathroom. I think this is great. Get him into good oral hygiene habits young! It’s a shame my other three don’t share his enthusiasm. My 11 year old daughter Bunny, is another story. Toothbrushing is a fight with her. She tries to get out of it as much as she can and rarely brushes for the full two minutes. Sometimes I wonder if she’s even managed one minute. It’s not surprising when you look at the statistics. 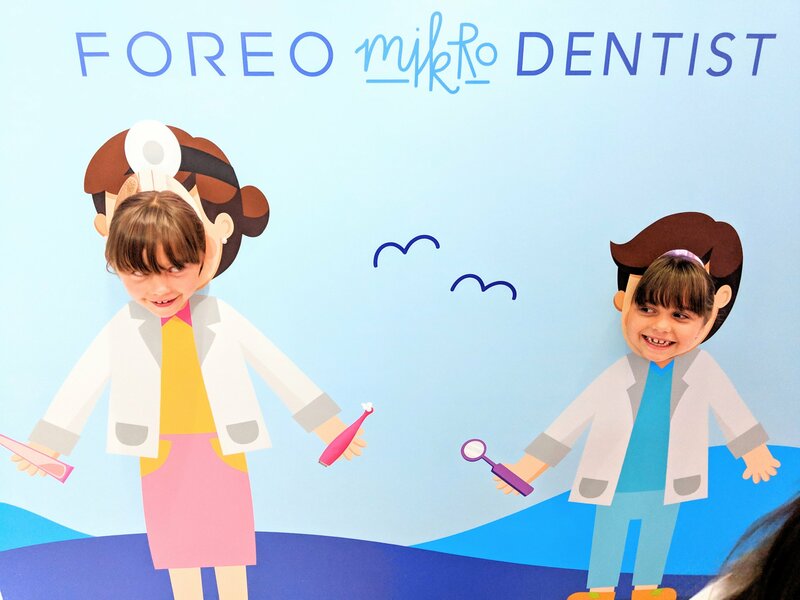 According to research carried out by Foreo Mikro Dentist 55% of 3-5 year olds have one filling. That figure is even more astounding when you consider that most children in the UK don’t visit the dentist until they are 4 years old. 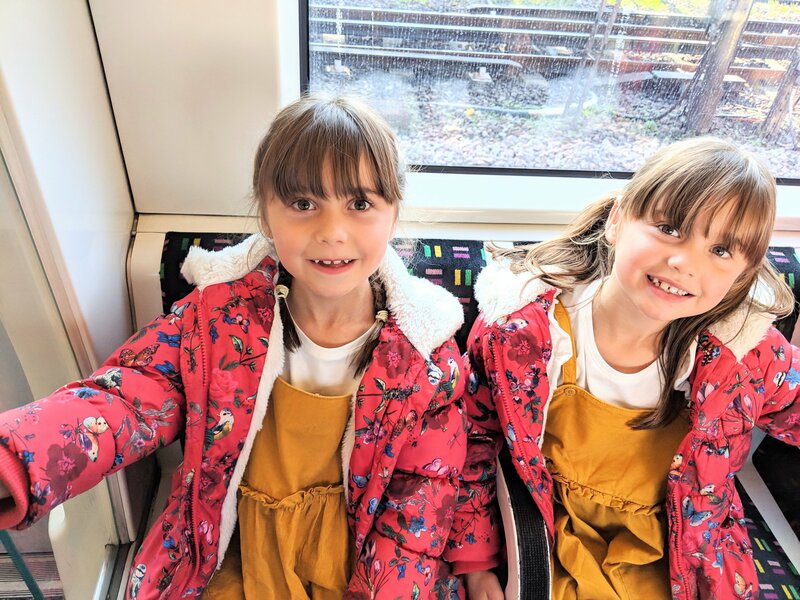 The twins were hugely excited about their day trip to London and getting to go on the London underground. 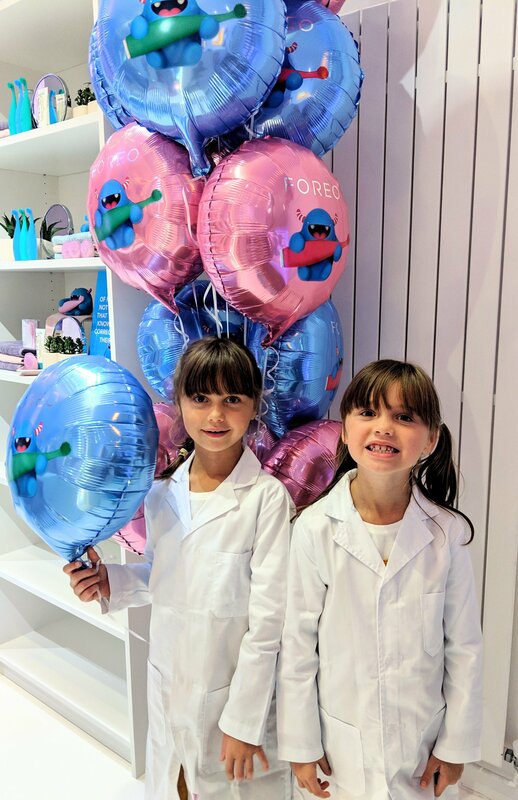 When we reached the pop-up Foreo Mikro Dentist, the twins were given lab coats to wear, so they’d look and feel like dentists! 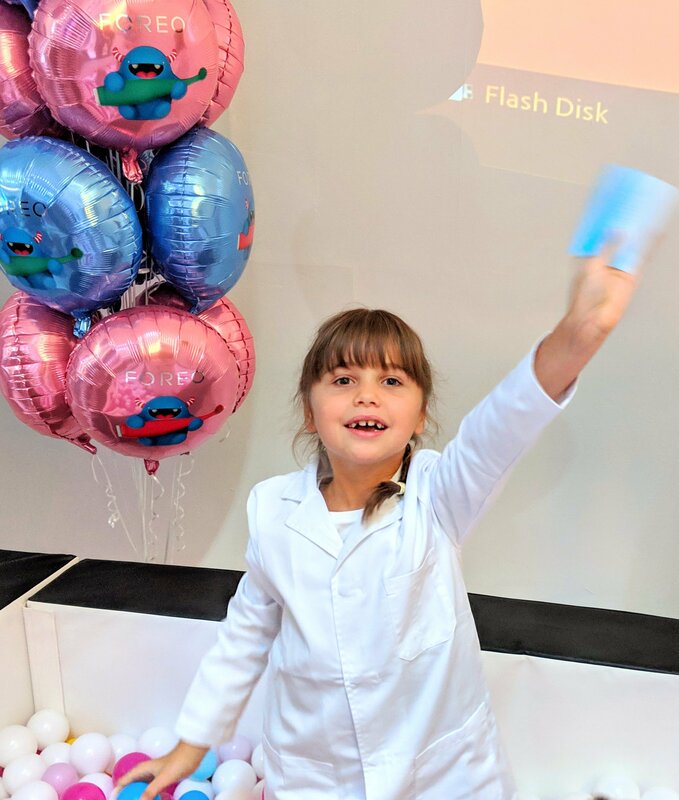 Inside the Foreo Mikro Dentist, there were a multitude of activities to take part in. 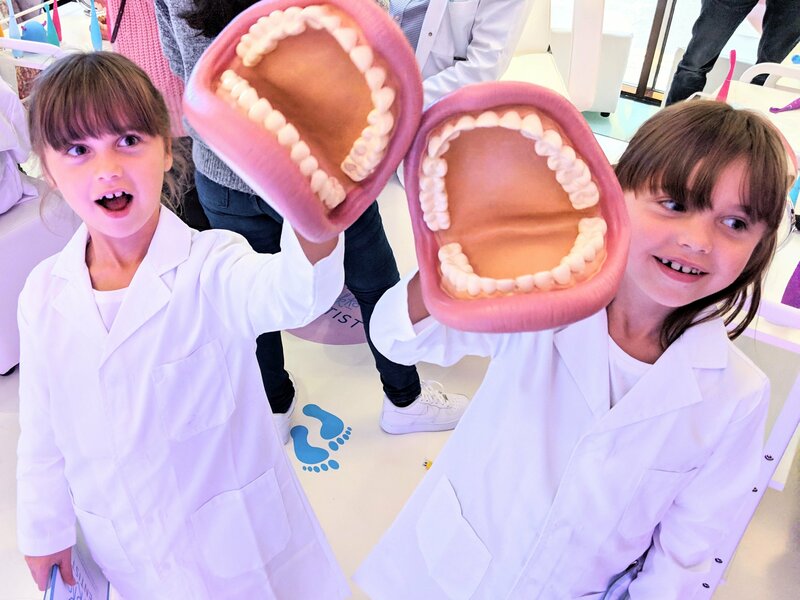 The twins played with some giant teeth, some wind up teeth and had a look at the Foreo toothbrush range on display. Don’t worry, I did explain to Fluffy that the Foreo Issa is for cleaning her teeth, not her ears! 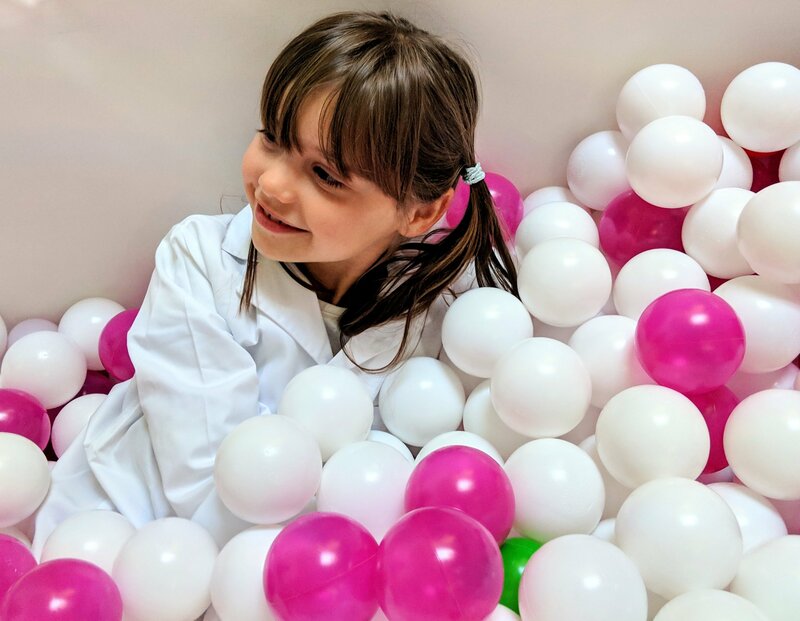 They both jumped into the ball pit to find a ball with a magic star, to win themselves a cuddly teddy bear sporting a Foreo Mikro Dentist t-shirt. They tried to win another by playing on a grabber machine, but sadly it wasn’t to be. Some other children kept jumping the queue in front of us to have multiple turns too, which spoilt the fun a little. So Tiny and Fluffy cracked on with some drawing and some playdoh for a bit. 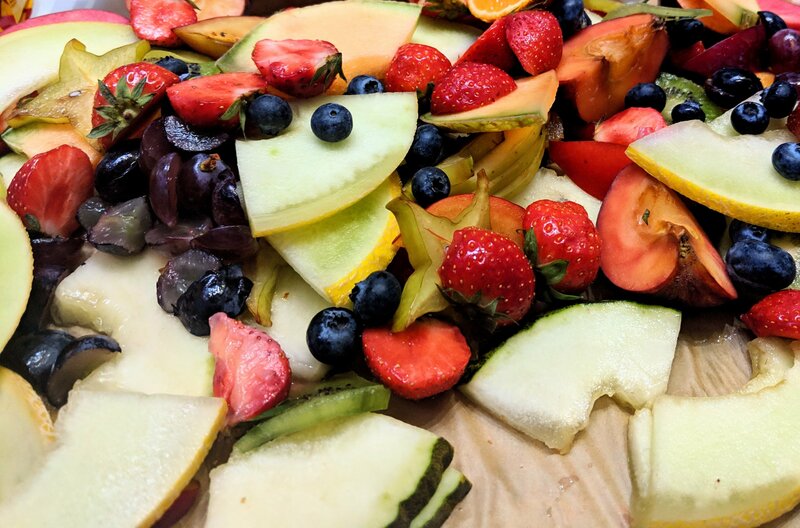 There was also the opportunity to enjoy some healthy snacks and chat to leading cosmetic dentist Dr Mark Hughes. The pinnacle of the day for the twins though, was getting their faces painted and meeting THE TOOTH FAIRY. I’m sorry Dr Mark Hughes, but in the eyes of a 6 year old, you’ve got nothing on the tooth fairy! The very kind people at the Foreo Mikro Dentist let us take home two extra teddy bears, one for Bunny and one for Bear. Bear has slept with his, every night since. They also gifted the twins a Foreo Issa Mini 2 which is a kids electric toothbrush. But, “what’s so special about this toothbrush?”, I hear you cry. Well it’s a very innovative, high tech toothbrush. I’m going to speak specifically about the Issa Mini 2 Sensitive, as the other Foreo Issa toothbrushes are slightly different. The Foreo Issa Mini 2 Sensitive, has bristles made from non-pourus, quick-drying, medical-grade silicone. The purpose of this, is that it’s super soft on the gums and doesn’t scratch the tooth enamel or sensitive gum tissue. 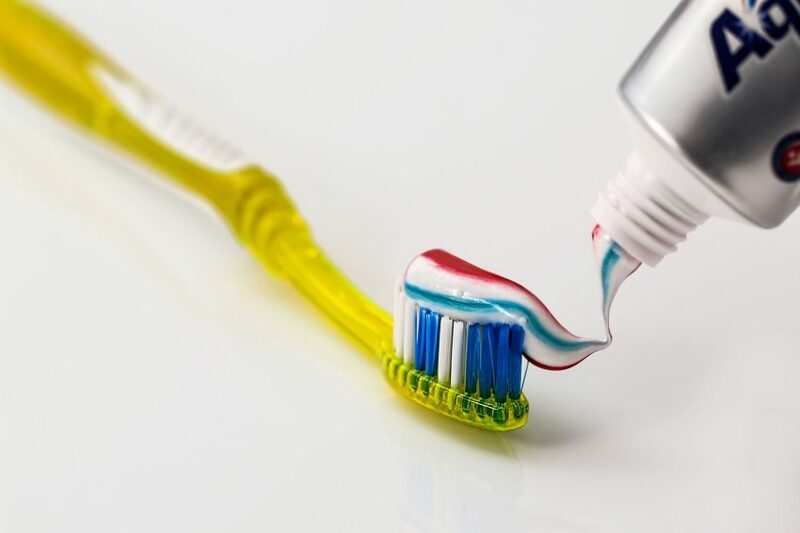 It also gives the gums a gentle massage at the same time, cleaning gums, as well as teeth. It’s also ultra hygienic. This kids electric toothbrush repels bacteria and carries 10,000 times LESS bacteria than an ordinary nylon bristle toothbrush. This brush head also lasts for a whole year and the toothbrush itself has a ten year quality guarantee and a 2 year limited warrantee. Just think how many manual toothbrushes you’d have sent to landfill in that time! As with all the Foreo Issa toothbrushes, the Foreo Issa Mini 2 Sensitive toothbrush doesn’t have a rotating head. Instead it uses sonic pulses to aid teeth cleaning and actually pulses at a rate of 9000 high-intensity pulsations per minute. It takes just one hour to charge the Foreo Issa Mini 2 Sensitive from the USB charger that comes in the box. The toothbrush will then hold its charge for around 265 days. The design also means it’s easy for small hands to hold, has a 3D flexible brush head to reach every tooth and is fully waterproof. So no big deal if the kids drop it in the bath. The Glee and Glum faces. This is what has transformed toothbrushing for my children from the mundane to the exciting. The Foreo Issa Mini 2 and Mini 2 Sensitive have a built in timer, which times for two minutes. After two minutes of brushing, the end of the toothbrush lights up, the handle vibrates and a smiley face lights up with GLEE! 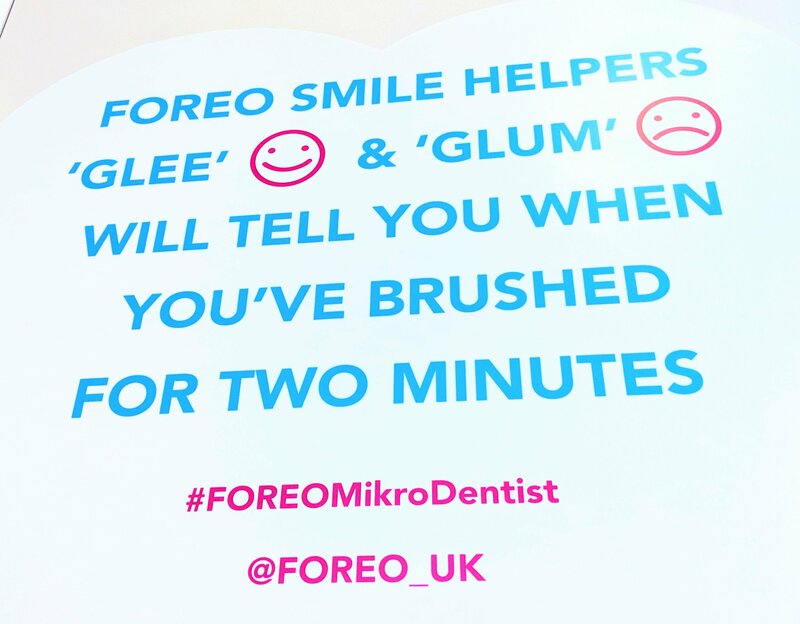 And I kid you not – if you don’t brush for a full two minutes, you get the glee face for effort, but you also get a sad GLUM face light up for not completing the task! And finally, if you do not brush your teeth every twelve hours, the Issa Mini 2 flashes it’s glum face. The twins find brushing their teeth so much more exciting with the Foreo Issa Mini 2 and I wish I had the Foreo Issa Mikro for Baby Bear and the Foreo Issa 2 (adult version) for Bunny. The Foreo Issa Mini 2 Sensitive kids electric toothbrush retails at £99.00 (as is the regular Issa Mini). It comes in a choice of two colours – Wild Strawberry (pink) and Summer Sky (blue). 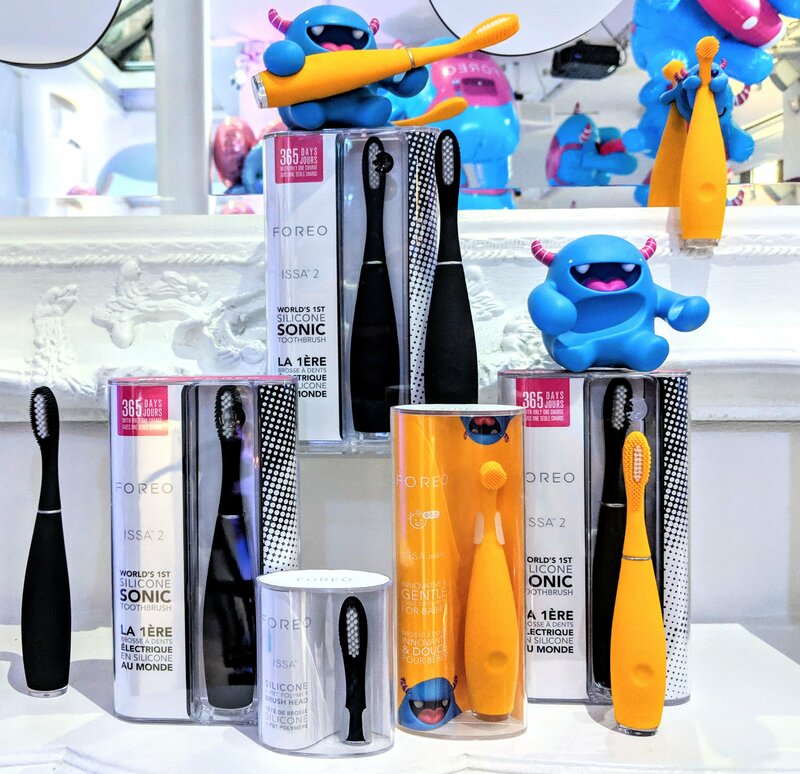 There are a whole range of Foreo Issa toothbrushes available, including a mix of regular and sensitive brush heads and toothbrushes for all ages. Different models have different colour options. You can find out more on the Foreo website. Disclaimer: I was compensated for my travel expenses in order to attend this event and two of my children were gifted with toothbrushes. All words and opinions are entirely honest and entirely my own. This entry was posted in Health, Reviews and tagged electric toothbrush review, family dental care, oral hygiene. Bookmark the permalink.